Kale is in the cabbage family; like collards, it is a non-heading form of cabbage. When I did some research, I discovered that both kale and collards have been in existence for over 2000 years, grown and used by the Greeks and Romans. It is noted as coming to America around 1669. There are several varieties of Kale and each varies in its best use. 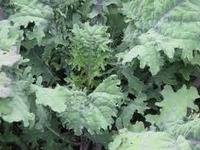 Red Russian Kale has flat green leaves with frilled edges and red or purple stems. These leaves are the most tender of all the varieties and can be used in salads, especially smaller, younger leaves. Lacinato (blue) Kale, also known as Dinosaur kale , is an Italian heirloom variety with narrow, straight-sided leaves. It is a blue-tinted green in color and has a hearty texture that stands up well in soups and braises. Green Curly Kale is bright green with very curly leaves. It is best used cooked in recipes, since its leaves are a bit tough for eating raw and become more tender with cooking. Store kale in the refrigerator like lettuce - unwashed in a plastic bag for up to 5 days.